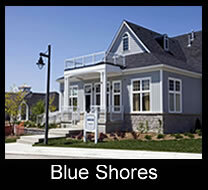 Blue Shores, Collingwood, built by the Kaitlin Group, is a unique, private waterfront community of just over 200 homes in the east end of Collingwood, Ontario. All homes are single family detached with stunning architecture reminiscent of Cape Cod style homes with large windows and cupolas. Blue Shores has outstanding amenities including a private marina with deep water channel and waterfront trails. 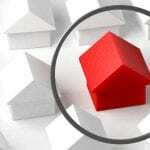 Homes are owned and the public areas are under a Condominium Corporation. The condo fee includes snow removal to your front door step and landscaping including grass cutting, weeding, tree and shrub trimming and garbage removal.The fee also provides owner access to the private Shore Club, a community clubhouse with both indoor and outdoor salt water pools, indoor hot tub, large patio overlooking Georgian Bay, library, meeting rooms, gym, games room, pool table, children’s playground and waterfront tennis courts. The Shore Club is staffed with a wide variety of events and fitness programs.The harbour is man made and and provides excellent shelter for boats. 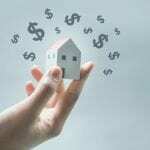 Home owners can purchase or rent a boat slip. 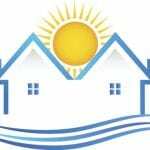 PKA: Blue Shores – Marine View Drive, Waterfront Circle, Clubhouse Drive, Beachside Lane, Surfside Crescent, Waterpond Place, Pebble Beach Court, Newport Blvd. Amenities: Clubhouse with both indoor and outdoor salt water pools, indoor hot tub, large patio overlooking Georgian Bay, library, meeting rooms, gym, games room, pool table, children’s playground, waterfront tennis courts and marina.